Drauka is 6’11", tall and wiry, 250 pounds of steely ropes of muscle covered by light mocha skin. His physique is like that of a stalky human or an elf. His nose is broad and blends into his cheeks, has sharp teeth with elongated canines. Not quite fangs. His pupils are like a cat’s, and his eyes are a metallic blue. His hair is dark red, almost maroon, short on top and goes down his neck, across his shoulders, and down to the small of his back in a mane. He wears a bone necklace around his neck carved into the shape of a hook, and an Obsidian earring stud in the top cartilage of his pointed ear to represent his dead daughter. Over his heart there is a ridged scar about one palm in diameter. He has a tattoo on the back of each hand in the shape of a tear drop, and one on his thigh in a continuous ribbon. The tattoos resemble the Maori tattoos of Earth’s New Zealand tribes. He also has a tattoo on his chin and upper lip, the sign of marriage. I am Drauka, Husband of Raq’el, the Shabet-ta of my village. We have lived peacefully for two generations in our village on the borders of a forest half a day’s journey from a Human settlement. The City, Sweet Creek was built up around a Temple to Gods, a gaudy pyramid jutting out of the plains; as such there was always a steady stream of missionaries in and out of the Gates. Many of these enjoyed rest in our village before finishing the journey home, and some stayed for a good period. As husband of the Shabet-ta, it was my job to make sure there were accommodations for them, and be a barrier for the virulent disdain that my people feel toward them. Though we have forsaken a nomadic lifestyle, we still adhere to the traditions of our fathers, and it makes me shudder to think of handing my life over to a self-serving and undeserving deity. One fateful day, our scouts came back with word that there were creatures doing recon of our village. They had covered themselves with mud to not be recognizable, and disappeared into the forest when any of my sentries tried to get a closer look. Late that night they invaded, a small group of Wolfen. They snuck into my home, took my wife and daughter, and left. In the struggle, I was awakened, and pursued the fiends. I caught up with one, who appeared to have been injured in the incursion and had fallen behind. I noticed that it wasn’t in fact Wolfen, and ripped off his disguise. 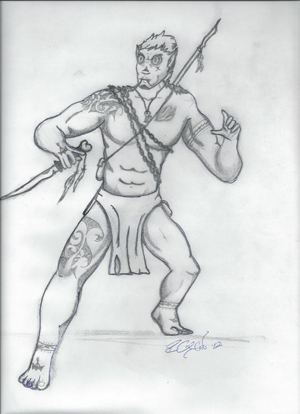 E’Dehko, a violent Danzi clan. After… asking… him “politely,” he revealed the plot to incite our Shabet to join in their cause against the canine humanoids. Infuriated, I tracked the rest of the group to an encampment several miles away from my village. I could hear my wife’s anguished cries, almost drowned out by cheerful calls, though there was a void somewhere in there I couldn’t quite name. I prowled up to the tent closest to the central fire to rescue them, and realization ripping through my consciousness as I see the void, the lifeless form of my daughter, rent in two by an enraged caged Coyle, her mouth wrenched open in a silent scream. Though my rigorous training in the years since has allowed me to block much of that night, nothing has kept her accusing eyes out of my dreams. My wife’s screams were coming from a close-knit group of Danzi off to the left of the globe of firelight. Whoops and hollers were coming from the men surrounding her. I shut my eyes mentally, closed off my feelings. I grabbed my bone-carved bolas at my side, snuck around the outer edge of light, and started to pick off the distracted wretches one by one. Only the bone-deep tradition of preservation of Danzi stopped me from slaughtering the lot of them. By the time I had incapacitated enough of them for one to notice, it was too late. There weren’t enough to challenge me. A battle ensued in which I was gravely injured, but managed to defeat the i’nshauta. Bleeding, limping, dying, I carried the ravaged, limp form of my wife to my village. The alarm long-since raised, the Shabet was gathered in the Central Yard when I arrived. I was asked what happened, my perspective, and I labored through the telling amidst bandages and salves being applied. After telling my story, Fifka, the Shabet-tza of the village told me that a hunting party was sent to track the insurgents, after I had left. The young warrior I interrogated was found dead, though the rest were merely injured and groggy. A Danzi life is held as sacred among my people, since we are so few; to take one, as a Danzi, no matter his crime, is the ultimate sin. I was put up on trial later that day and cast out before lunch. As part of my expulsion from the Shabet, my clan tattoo was ripped from my chest; my reminder of friends and family replaced by an ugly ridged scar over my heart. While I contemplated what I should do, and where I should go, I received a visit from a glorious being, clothed in light, whose voice resonated like the bottom of a cavernous lake, and eyes shone like the sun at noon. He told me there was much work to be done, and that the insanity that gripped the E’Dehko tribe that took my wife was raging across the land. I was told that the only way to save all peoples was to help restore life to the God Osiris. I was wary, for such talk of gods and quests is usually done by selfish over-powerful beings, using mortals as pawns. He said his name was Horus God of War, Retribution, and Love. I asked him to prove he really was the god of love, and promise to keep my loved ones safe, protect my village. He promised, on the dead god Osiris, that my shabet wouldn’t meet any harm. I accepted his quest, and got myself ready. I was whisked to an island called Lemaria where he said I would encounter a group of travelers that call themselves CrIsis. A feeling deep within me was awakened; it burns like fire and fills my limbs with renewed strength. This feeling I call Zan’goria, which does not have a translation. The closest I have found is this: Vengeance. Drauka portrait by Gaitkeeper. Full size picture can be found here.